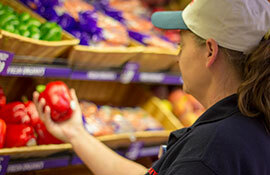 Between the time we get the produce from the farmers and the time you pick it in our store, we do more to maximize and maintain freshness than most other grocery stores. The ripening process begins at our distribution center, which reduces the time from harvest to the store. Our produce experts cull the department every few hours to ensure freshness, even washing and crisping the produce whenever necessary. If you’re wondering why we’re so picky, it’s so that you don’t have to be. Whether our produce comes from the international marketplace or the farm right up the road, we take a lot of pride in the relationship we have with the farmers. 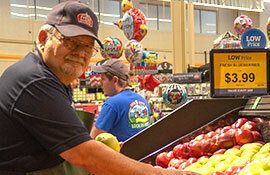 We understand the passion they pour into their produce, and the same passion is carried into our produce department. Produce is nourishment, and it takes nurturing to ensure its freshness. That’s why we take our part of the process very seriously. Next time you have a question about our produce – like how to recognize ripeness or maintain freshness – don’t hesitate to ask. 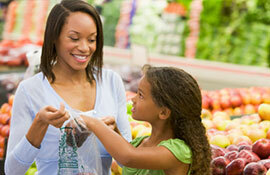 Our highly-trained produce experts are prepared with answers.